We’ve all seen it on the roads, especially in Johannesburg. This time, there was a punishment. A taxi driver on the wrong side of the road during peak-hour traffic has been schooled by a concerned citizen on a motorbike. The age of social media is not a bad thing after all. Taxi drivers have made it a habit to drive into oncoming traffic if there’s peak-hour traffic. In this case, a frustrated biker stopped a taxi driver and forced him to reverse and join the rest of the traffic. What happened to the taxi driver who broke the law? 'Ask the Chief JMPD' on Twitter tweeted good news! 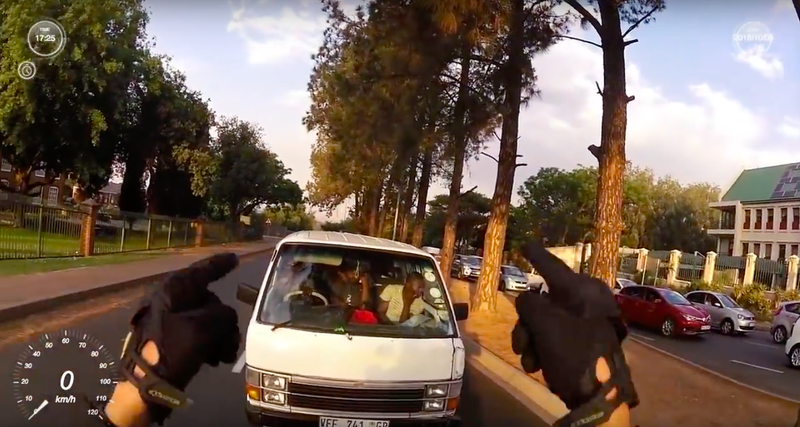 "The Taxi driver that was captured on camera by a biker driving facing oncoming traffic on Sloane Street in Bryanston has been arrested by JMPD officers." This example of such behavior on the road, unfortunately, happens often. Have you seen this happen in your area? Let Martin Bester know in the comments section below.